I’ve spoiled a lot of friends and family with some good food over the years, but one of my most requested dishes is my traditional Costa Rican ceviche. 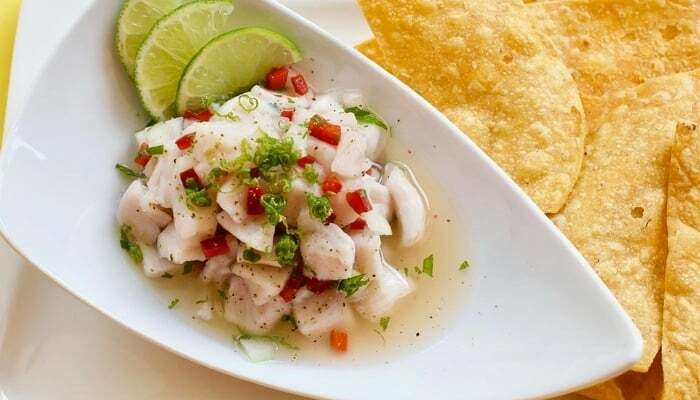 While Peru claims to be the true origin and king of ceviche, it’s popular throughout Central America. And here in Costa Rica, it’s a typical dish, popular in the coastal areas. While each Central American country will have slight differences in how they prepare their ceviche, Costa Rica features a simple version that many people love. 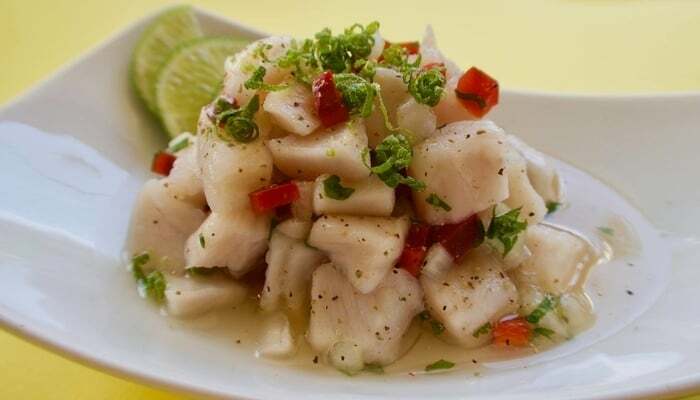 Ceviche is a dish comprising raw fish and seafood marinated in citrus juice, mostly lime or lemon juice. The acid in the citrus juice break the amino acids in the proteins of the fish. This causes it to become opaque and produces a firm texture, like when cooked. In effect, the citrus juices “cook” the fish. In Costa Rica, the ingredients for ceviche are usually fish, lime juice, salt, ground black pepper, onions, cilantro, and minced peppers. Ticos often serve it in a cocktail glass with a lettuce leaf and crackers or chips on the side. Now I think it’s wrong, but many Ticos use condiments like tomato ketchup, mayonnaise, and/or Tabasco sauce on their ceviche. For me, a good ceviche needs no condiments at all, but don’t think it’s strange if someone asks for the ketchup. 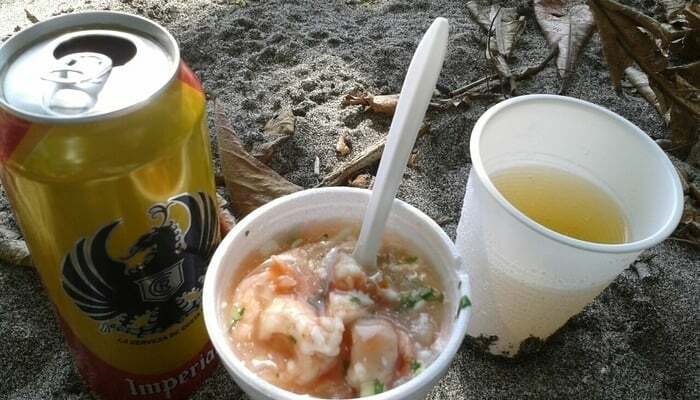 Ceviche is best accompanied with an ice-cold Imperial beer on a beautiful Costa Rican beach, but we’re not all lucky enough to be on one of those. The good news is now you can transport yourself in your imagination to the Costa Rican beach of your choosing when you whip up your own ceviche. Before you start, you need some fish for your Costa Rica ceviche recipe. You can use many types of fish for ceviche and the below options all work well. Corvina is a wild-caught fish in Costa Rica and other parts of Central America. Known for its firm white meat, Corvina has become popular over the years throughout this region. It is one of the most common fish used for ceviche. Another very common fish for ceviche in Costa Rica, tilapia has a light, sweet, delicate flavor and semi-firm texture, comparable to catfish. Tilapia fillets are white with a mild taste. This fish can sometimes be more difficult to work with but is often used in many of the local restaurants. The firm-textured, dark meat of mahi-mahi turns white and opaque when cooked. It is a moderately fatty fish with a strong, pleasant flavor. The skin is tough and usually removed before cooking. Mahi is usually easy to find in Costa Rica and is a great option. This is my preference. The firmness is easy to work with and it holds its shape well. Marlin is another easy one to find throughout Costa Rica. So once you have your fish, it’s time to make your ceviche! Ceviche is easy to make and healthy, so please try it. Chop the fish in 1/2-inch squares. In a medium glass bowl, combine the fish with the lime juice, make sure the lime juice cover the fish. Add the rest of the ingredients, mix well, cover and let set for one hour in the fridge. Serve with chips or crackers and an ice-cold beer! Melissa Guzman is the author of the book “Living Longer, Healthier, Happier – Recipes from Costa Rica”, available through her website, recipesfromcostarica.com. Born and raised in Costa Rica, she also runs cooking classes and food tours in her country. She lives in Jaco, Costa Rica. Follow her on Facebook and Instagram for more information.